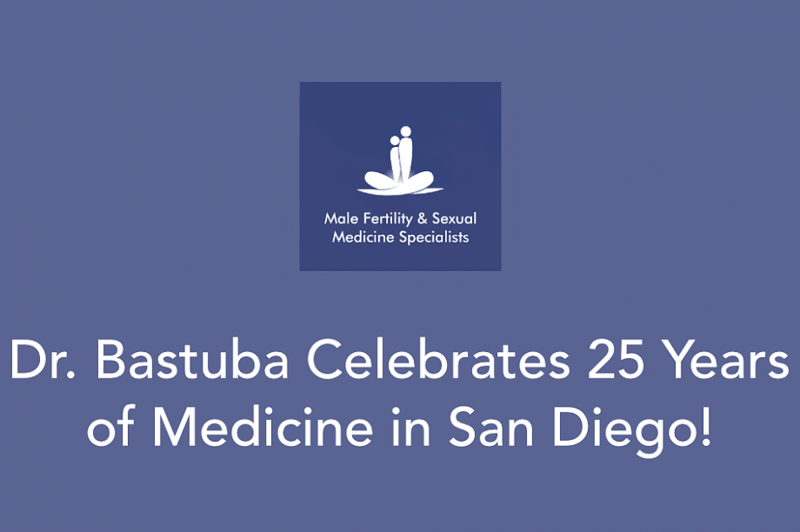 Martin Bastuba, MD, FACS is celebrating his 25th-anniversary practicing medicine in San Diego, where he helps expand families and ease sexual dysfunction. He came to San Diego after completing his Fellowship at Boston University School of Medicine and started his private practice, Male Fertility and Sexual Medicine Specialists, in 1993. For more information about his medical and surgical training, as well as his philanthropic contributions to the San Diego community, please see his 20th-anniversary press release. Dr. Bastuba is a compassionate and knowledgeable surgeon with a timely sense of humor that helps to ease patients struggling with difficult circumstances. Patients generally do not have the opportunity to see their doctor outside of his or her medical scrubs, white coat or have the time to discuss things outside of the patient’s own health. In order to fully understand Dr. Bastuba beyond his curriculum vitae, he wanted to share some more personal aspects of his life and career in honor of this anniversary milestone. Q: What led you to pursue medicine? A: Coming from a very middle-class family, I was the last of six boys. I was the only one to really pursue a college degree. Our dentist had a large influence making me believe that I could shoot for a professional degree. At medical school, I originally thought about being an emergency room physician. However, from the first time I started a surgical rotation, I knew I wanted to be a surgeon. When I rotated through Urology, I found a group of physicians who truly love what they did with many interesting challenges. Q: What led you to focus more on fertility? A: I was not exposed to microsurgery until my 4th year of a 6 year Urology residency training. From my first microsurgical case, I was aware that it was a unique challenge and something that I felt particularly drawn to. As I learn more about fertility, I became further drawn to it because of the complexity and because of the opportunity to treat two people instead of one. Not only do you please your patient, in this instance the male, but you also have the opportunity to change the couple's life in a very positive way. It is not lost on me that fertility is one of the most important things in life to most couples. Similarly, my Fellowship involved the treatment of males with sexual dysfunction and this is another huge quality of life issue for people. A: I believe actually Delta Airlines. As I was finishing my Fellowship training at Boston University, various opportunities presented themselves. My wife and I discussed the possibility of moving out West. It seemed that this would be the only realistic time to try. We fell in love with San Diego. We have now been here for 25 years and have brought up our family here and become imbedded in the San Diego community. Q: How have you advanced fertility treatment? A: My approach to the care of patients has always been on a primary clinical focus. I am not one to travel the world giving lectures, but I am much more involved with taking care of patients here in the San Diego community. However, I am proud of the fact that we have had couples come to us for care from over 30 countries around the world in the past 25 years that I have been here in San Diego and this tells me that we are doing something right and that we are truly making a difference for people. Q: What are you most passionate about within this field of medicine? A: After practicing for over 25 years in San Diego, that it is the relationships I have enjoyed with patients and staff that have brought a deep satisfaction over the years. I have had different jobs before going to medical school and while in college and I knew when I had the opportunity to deal with patients medically that it was my dream job. Q: What do you think sets you apart from other physicians? A: One of the things that I believe sets us apart from any other physician in this country and possibly in the world, especially in terms of vasectomy reversal care, is that we not only provide the highest success rates in the world for successful return of sperm to the ejaculate, but we also offer postoperative complete fertility care. We have a nurse practitioner who is dedicated to evaluating females both before procedures and after. We have a lab that can comprehensibly evaluate both the male and female in terms of potential pitfalls to successful fertility. But more importantly, we are dedicated to following the COUPLE postoperatively, so that we not only are there to provide patency (the return of sperm to the ejaculate), but we work diligently towards achieving pregnancy which is of course the most important fertility goal for couples. I believe it is this comprehensive care combined with the compassion for all couples that allows us to achieve truly successful outcomes for the maximum number of patients. A: Well, of all the things I am most proud of would include my wife and three boys. Being the last of six boys in my family, it has been very natural to have sons and I get a lot of enjoyment out of working with them to become men. This involves a lot of my time, but I still have many personal interests. With the help of my mother and brother, I bought my first drum set at about age 13 after saving money from mowing lawns. I am still a drummer and very much enjoyed playing in a rock group about once a month or so. We are called the Retro Rocketts and we play a lot of songs from the Eagles, the Beatles, and even some from the Moody Blues. I get a lot of satisfaction from doing things with my hands and always have and so the control of drumsticks has some similarities to the very fine control of microsurgical instruments and there may be a connection there. I also very much enjoyed the connection between a musician and people who are enjoying the music. Q: What are the things that you are currently doing and most excited about? A: Probably the biggest thing is that, after years of effort, we have worked out a relationship and with the United States Navy for training of Urology residents in male fertility and sexual dysfunction. It gives me a great honor to try to help our nation's military in any way that we can between our various entities. I obtain great satisfaction from trying to pass on knowledge to some of the young bright minds that are in the Navy Urology Residency Program. Another area of current interest is in the evaluation and clinical application of new areas of technology. Our current focus has involved the use of micro-fluidics chambers to try to improve the differentiation of healthy from less healthy sperm to try to improve fertility outcomes. This technology will have applications for intrauterine inseminations, as well as applications for in vitro fertilization. The overall goal is to try to improve the fertility outcomes for couples and I believe this technology has a very good chance of changing things in a positive direction. Another exciting area that we are pursuing is to try to minimize surgical interventions. In this case, we have developed a way of retrieving sperm from patient's who have obstruction such as following a vasectomy, by simply placing a small needle through the skin and being able to draw up tissue so that we can extract sperm from it for use with in vitro fertilization. This procedure may be called seminiferous tubular aspiration, but a more typical term for it is testicular sperm aspiration. We have found, over the past year of study, that the technique does just as well as an open procedure which I have used for decades now called testicular sperm extraction, but that it does so without any opening into the skin other than that with a small needle. As is apparent, Dr. Bastuba is an approachable surgeon that does his best to help alleviate pain and hardships for his patients by developing new techniques, spreading knowledge, and facilitating the advancement in the field of infertility. He hopes to spread awareness and remove the stigma associated with sexual dysfunction and infertility by discussing these topics as a featured expert on the Roni Deutch radio talk show. If you or someone you know is struggling with infertility or sexual dysfunction of any kind, please do not hesitate to call Dr. Bastuba’s office at 619-286-3520 to schedule a consultation. Mention this article to receive a onetime discount of 10% off your appointment! Alternatively, feel free to learn more at www.malefertility.md.